The discourse of Ibu in tafsir does not follow its discourse in the Qur’an which is just and equal, yet considers carefully on its existing practices in the history of humankind prior to the prophecy of Muhammad, and in the time of the Qur’anic revelation. Muslim scholars including Muslim women scholars from time to time especially in modern era re-produce, modify, and produce different narrations which often fall into the reduction of the Qur’an’s just and equal description of female agency. 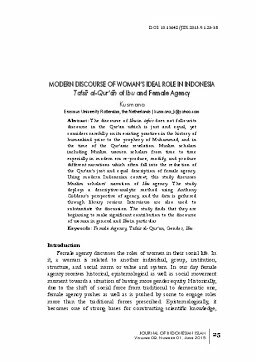 Using modern Indonesian context, this study discusses Muslim scholars’ narration of Ibu agency. The study deploys a descriptive-analytic method using Anthony Giddens’s perspective of agency, and the data is gathered through library review. Interviews are also used to substantiate the discussion. The study finds that they are beginning to make significant contribution to the discourse of woman in general and Ibu in particular.